Let us power your workspace efficiently and affordably. With automatic network check-in, unlimited inventory options, one-click reporting, a clutter-free dashboard that empowers members to manage their account, and a full-featured mobile app, Deskworks is the choice of top coworking spaces around the world. 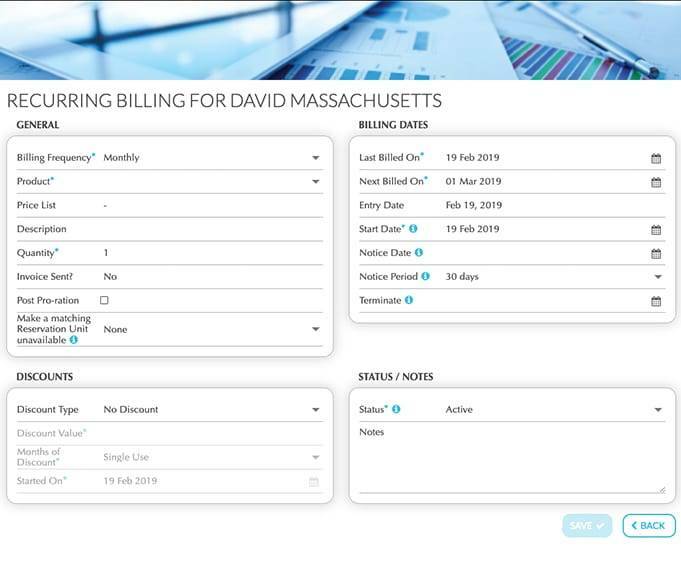 The Satellite Deskworks dashboard gives members at-a-glance information, including reservations, available credits and passes, payment history, message board and an overview of upcoming billing and charges. Beautiful, intuitive UI engages members in your center from the start. Real time reservations and calendar view. Member self-registration, plan selection and agreement to Terms of Service. Option for staff to register new members offers real-world flexibility. Members can pull statements, edit their profile, add or change billing information and view resources used. Message Board lets members directly connect with others. Automation empowers members and frees up staff time. Mobile app lets your members access your system easily, the way they want to engage. Get up-to-the-second reports on income, accounts receivable, items sold, membership and more. Real-time reports instantly generate on-screen. Deposit reports reconcile to bank-downloaded information. Report on any date range. Download reports as .pdf or .csv. Flexible reporting: See only the information you want, ordered how you want. Drill-down pie chart to see income by item. 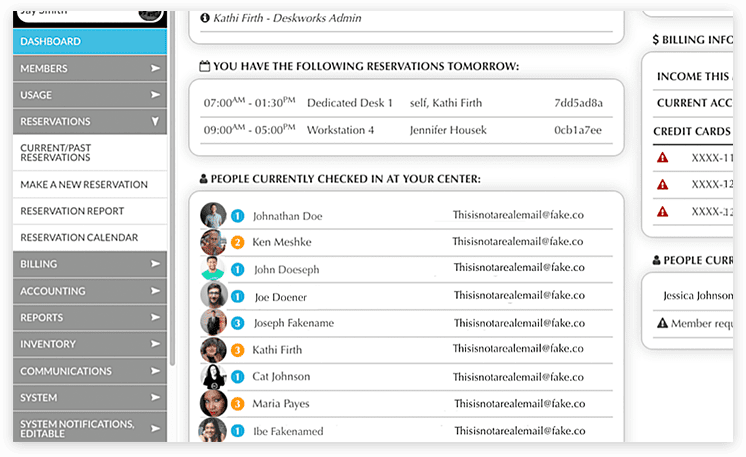 Make reservations as you need them through the Deskworks dashboard or mobile app. Our clean interface makes bookings a breeze. Easily make and update reservations. Select dates and time slots in real-time on our interactive calendar. Reservation notifications are pushed to both user and space operator. Reservable inventory can be added and removed with one click. Real-time view on aggregator sites (Liquidspace, CloudVO, Peerspace, etc.) through automatic integration with Google Calendar. Deskworks simplifies and automates billing and accounting, so you can focus on — and enjoy — your members. 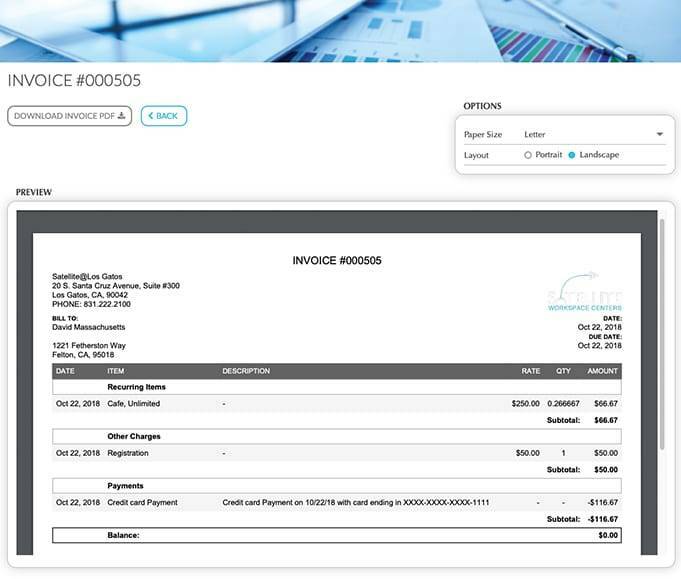 Reservations and usage automatically sweep and post to monthly invoice, along with recurring charges, one-offs and credits. Payments by credit card, ACH or check on any automated schedule. Discounts, refunds and write-offs on the fly. Automatic prorations at both start and termination. One-click posting of monthly print/scan/fax/copy charges for any printer. 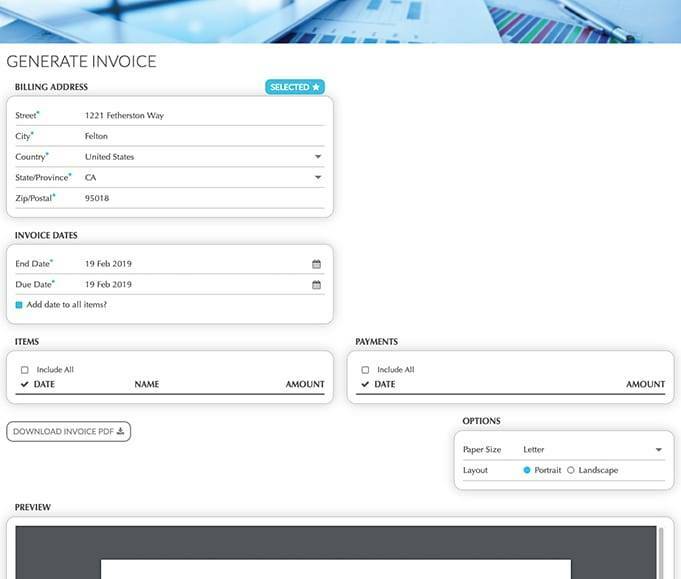 One-off invoices and statements in seconds. Custom charges and payments posted, viewed and processed any time. Automated notices for receipts, declines and expired credit cards. Part number system for organizing products and tracking what sells. Simple deposit reconciliation, income, AR, recurring billing and sales reports. 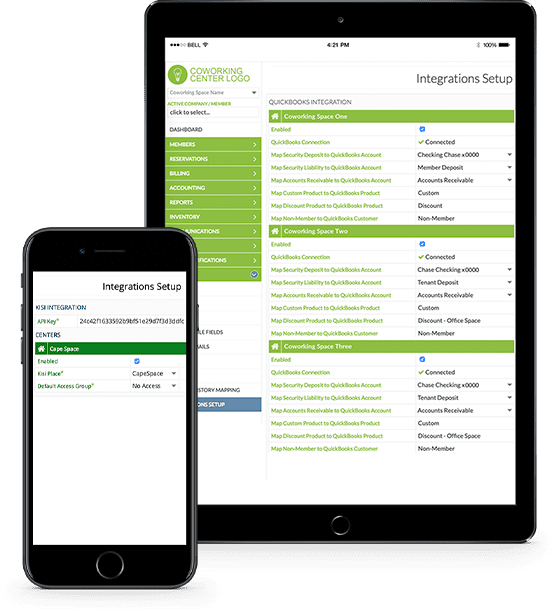 Direct, full-featured Quickbooks Online integration. Creating new membership plans, reservable resources and services is easy with Deskworks. 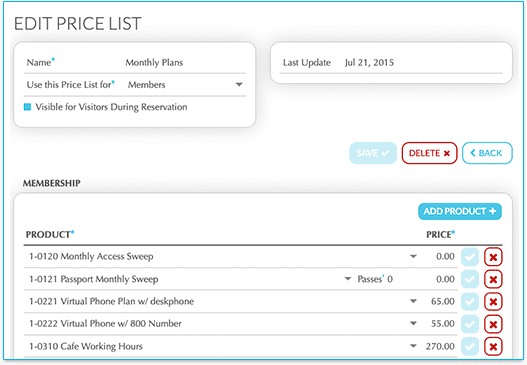 Add passes, reservation credits or permissions to any plan, and choose your own billing schedule. With Deskworks, you can offer as many items as you’d like and add unlimited prices for any item. Add or remove features of any membership plan whenever you want. Deskworks is designed to grow with you whether you operate a small coworking space or have scaled to dozens of centers. Deskworks is seamless, with the flexibility and strength to power your business and community. View reports for one or many centers, by region or (for franchises) by owner. 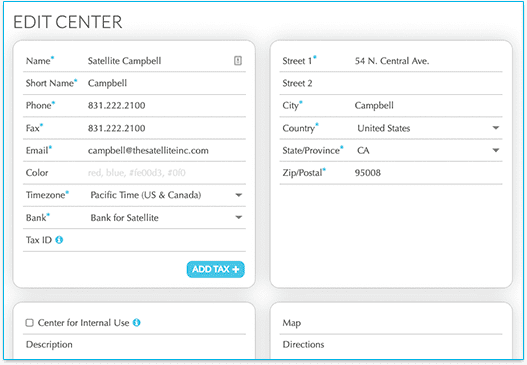 Click “New Center,” enter a few bits of information, clone a pricelist, and you’re ready to go. Products and Membership Plans work across all centers. Members can be activated anywhere and usage can be tracked across multiple centers. See exactly who’s in your workspace at any time, from any device or location, right on the Deskworks dashboard. Optional Network Check-in recognizes connected devices and gives instant network permissions, tracking your members against their plans for auto-billing. Auto tracking and billing let you easily offer a variety of plans and bundles, maximizing workspace revenue without manual tracking. Automatically send wifi codes with new reservations and day pass purchases. Sell day passes on the fly to non-members, without taking up staff time. Deskworks integrates with the tools you’re already using and is made to be customized to match your workspace brand. White-labeled setup to match your website and logo. Our API lets you easily integrate with other apps and services—and we can do the custom integrations for you. Our cloud-based software allows easy access through desktop or mobile app. The Deskworks team prides itself on continuous improvement through new features and customizations. Easily add links from your dashboard to outside resources and website. 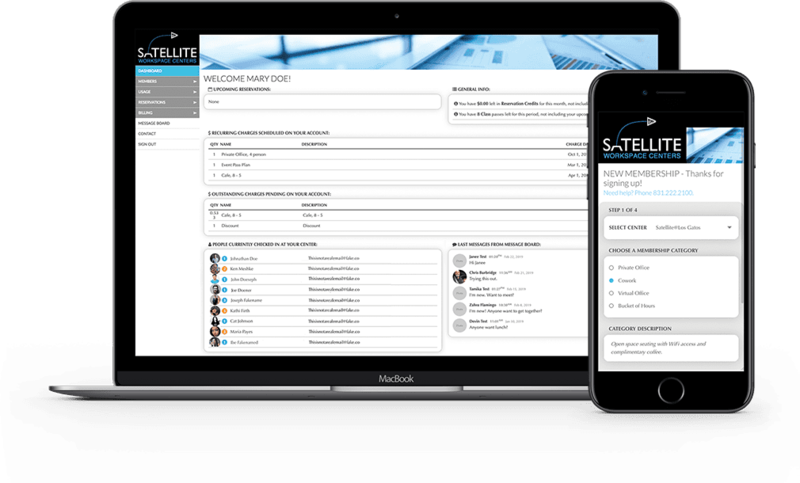 Experience the robust features of Satellite Deskworks by requesting a free demo. The go-to solution for workspaces everywhere. The product is remarkably flexible. We’ve been using DeskWorks for some time now. We’re running a lot of services with it, and we’ve been able to automate a lot of our business, reducing staff time considerably. The product is remarkably flexible. 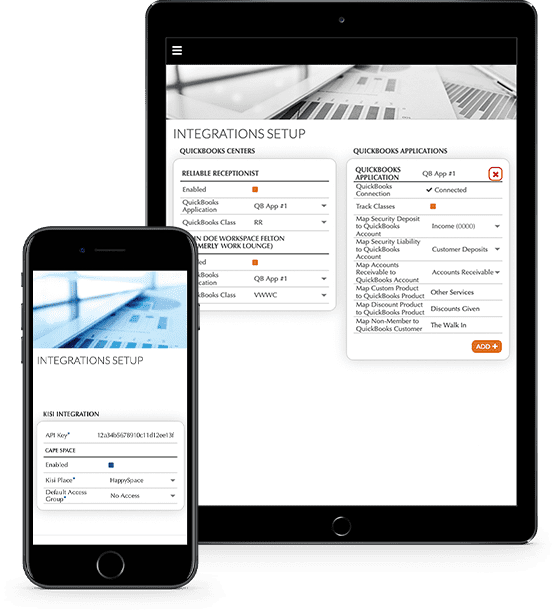 We use the API to connect with another couple of programs, and that has enabled us to really customize the sales process we were using. The Deskworks team has been highly responsive to our needs, resolves issues quickly and has even worked with us to customize the application for our particular needs. We’re a dynamic and agile company and we’re always trying to work smarter in place of harder. Too many precious hours were being spent trying to do this, and collect all of that. When we found Satellite Deskworks, it was wonderful to have a platform that could take all of that off our plates and make our processes more seamless. Three years ago I looked at basically everything that was on the market. Satellite Deskworks was the one that had the most features that worked for us, that made the most sense economically, and that could scale with us as we grew. If you're serious... Satellite Deskworks is it. If you’re serious about running your coworking space as a business—if you’re a business-minded person that wants ease in entering your members, tracking them, running reports, and having a robust management software, Satellite Deskworks is it. Everyone at the company has been so supportive and helpful. We started our center and immediately chose DeskWorks, after looking at everything else out there. Everyone at the company has been so supportive and helpful. We got a lot more than just software! DeskWorks is remarkably intuitive. It’s very easy for us to use, and our members can do so much for themselves that our job has become even easier! 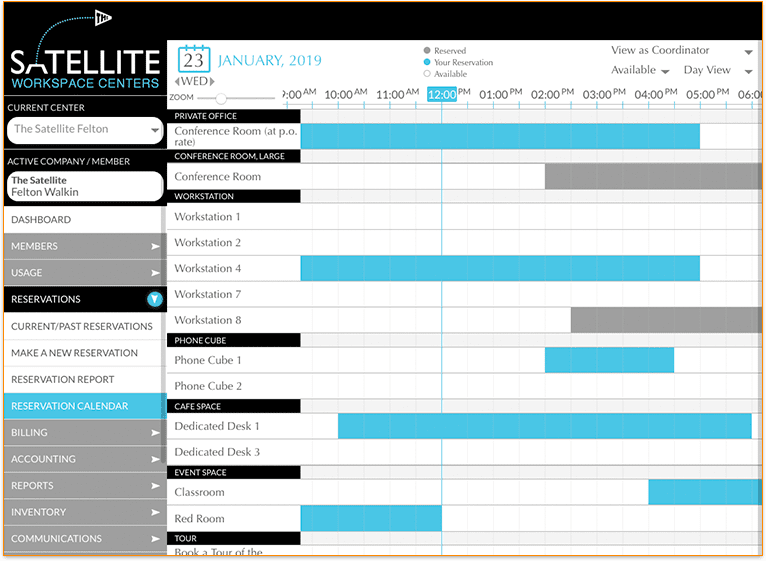 See for yourself that Satellite Deskworks is the best solution for your workspace management needs. The number of shared workspaces is increasing more than 50% per year. Make sure your space is one of the successful ones.